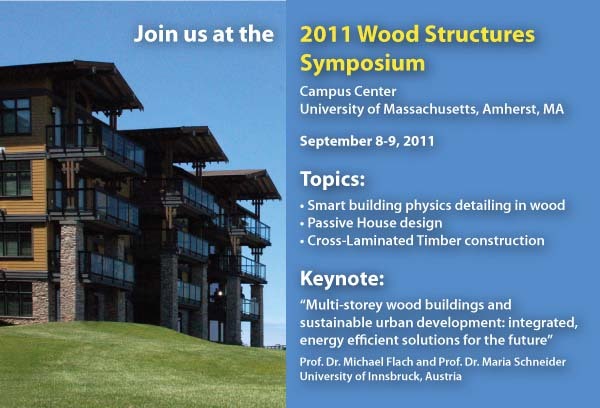 The 2011 symposium was held September 8-9, 2011 at the University of Massachusetts Campus Center, Amherst, MA. Presentations covered net-zero energy technology, environmental benefits of using wood and new, innovative wood building systems. Two afternoon workshops focused on detailing essentials such as thermal, moisture and acoustic issues, air tightness, and indoor air quality and ventilation. In addition, an exciting new wood product out of Europe, called Cross Laminated Timber (CLT), was showcased. Experts from both North America and Austria presented the essentials in achieving energy efficiency and sustainability in wood construction in this inspiring 2 day seminar. This year, we were proud to be partnering with the University of Innsbruck, Austria, home of many experts on Passive House design. The Passive House standard is known to be the world’s leading standard in energy efficient construction. Please Note: Slides and links have been provided to us by the presenters and all content is their sole responsibility.